If you have diabetes or high blood sugar, the glycemic index and glycemic load can help you choose the best foods to help you manage your condition. The main benefit of knowing the glycemic value of foods is that you can actively control your diet in order to achieve a healthier blood sugar profile. Even more, knowing them provides you with greater freedom in your choice of foods and allows you to best combine foods to both achieve good nutrition and avoid rises in blood sugar levels. The glycemic index (GI) estimates how fast the carbohydrates in a food raise blood sugar levels. It is a numerical scale that covers values from 0-100. Between 0-55 is a low GI. Between 56-69 is a moderate GI. Between 70-100 is a high GI. Diabetics and anyone looking to manage their blood sugar are advised to choose foods with a low GI and avoid high-GI foods as best as possible, whilst moderate-GI foods are best consumed infrequently or paired with low-GI ones to help reduce their effects on blood sugar. The glycemic index of cashews is between 21 and 27, which is low. This means eating cashews separate from other foods will likely not raise blood sugar very much. Eating them with other foods that are higher glycemic has the benefit of reducing those other foods’ effects on blood sugar. Also, the variation in glycemic value is not unusual at all – not all foods have the exact nutritional value and even slight variations in nutritional status can impact their health effects, including effects on blood sugar. Note: Raw cashews have about the same glycemic index as dried and roasted ones since these forms of processing do not impact nutritional status too much, at least not in a way that visibly affects blood sugar. The glycemic load (GL) estimates how fast the carbohydrates in a serving of a food raise blood sugar levels. The GL is a numerical scale that covers values from 0 to over 20. More exactly, below 10 is a low GL. Between 11-19 is a moderate GL. Over 20 is a high GL. What is interesting about the GL scale is that values for the same food change with serving/portion size. The bigger the serving/portion, the higher the GL. The smaller the serving/portion, the lower the GL. So the less you eat in one sitting, the lower the GL score. The more you have at once, the higher the score. The GL is calculated based on the glycemic index (21 – 27) times the number of carbohydrates in a serving, expressed in grams, divided by 100. Which means that, although the glycemic load of cashews is low, below 10, exact values change slightly with serving size and glycemic index score. For example, the GL values below are calculated for servings of 100 g, 50 g and 1 oz respectively and take into account first the lowest (21) and second the highest (27) glycemic index values for the nuts. A serving of 100 g of cashews provides 30 g of carbohydrates and has an estimated GL of 6-8. A serving of 50 g provides 15 g of carbohydrates and has an estimated GL of 3-4. A serving of 28.35 g or 1 oz provides 8.55 g of carbohydrates and has an estimated GL of 2. For more information on how the GL of the nut variety is determined, see article Can You Eat Cashews With Diabetes? However, despite the fact the cashews and diabetes make such a good pair, there are some rules to make them good for all aspects of diabetic health, not just blood sugar management. 1) Eat small amounts at once. You can start off with 1 oz servings. 2) Ideally, have one serving a day and don’t eat cashews every single day. This is to help avoid weight gain as a result of their high-fat, high-calorie content. 3) Choose raw, unsalted options to prevent excess sodium intake and associated side effects such as hypertension, a major concern in diabetes. 4) Avoid oil-roasted and sweetened options to reduce calorie intake and both protect the cardiovascular system and manage your carbohydrate intake. 5) Enjoy cashews as a snack on their own or pair with a fruit to reduce its glycemic effects. 6) Ideally, have them in the first part of the day, at breakfast, lunch or as a midday snack, so you have time to use up the calories they provide. 7) If you are allergic, avoid them in all forms. Conclusion: Are cashews high glycemic or low glycemic? Cashews are low glycemic because they have a low glycemic index and glycemic load score and minimal effects on blood sugar. Regardless if you’re diabetic or not, they are one of the best options to consider for blood sugar management. 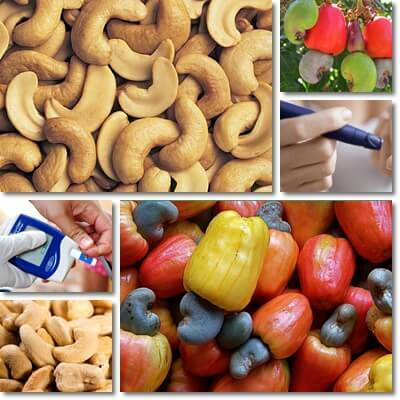 One of the benefits of eating cashews and other nuts for diabetes is they can be paired with other, higher glycemic foods such as fruits to reduce their glycemic effects. Having cashews with bananas, sweet potatoes, pumpkin or a vegetable salad not only reduces their effects on blood sugar, but also contributes to satiety, helping keep you full for longer as well as energized and active.